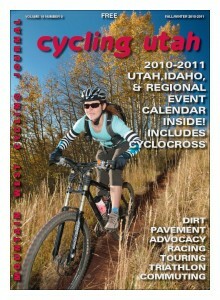 Our Fall Winter 2010 Issue is now available as a PDF (8.7 mb download) – Featuring Rider of the Year Awards, Cyclocross coverage and tech, Metal Cowboy Column, A Rockies Bike Tour, Lotoja, 24 Hours of Moab, Spoke Lit review, Delta 7 Profile, 24 Hour Bike Shop Profile, Primal Women's Pro Team, Using Cycling to Teach Science, The State of US Road Racing, Cross Out Cancer, UBC News, Collective News, Stories of the Road Review, Bicycling Studies, Results, Commuter Column, Mechanics Corner, Calendar and More! New: The ads in the pdf are now hyperlinks – click on them to go to the advertiser’s webpage. Pick up a copy at your favorite bike shop or other location today.